Brown Turkey is a hardy, reliable variety of fig tree which produces large dark brown figs with a red flesh. Fig Brown Turkey can be grown outside in a well-sheltered spot with plenty of sun. 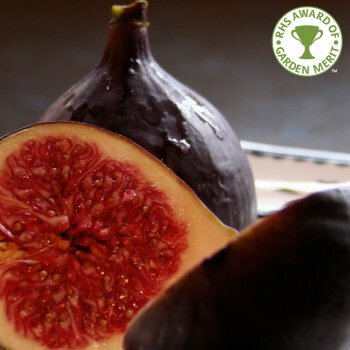 This fig is ideal for pot growing. If planting into the ground, Fig Brown Turkey should be restricted within a pot or 'fig pit' (a roughly 2 foot square pit lined with paving slabs or brick) to prevent the root system from getting too large. Given the right position figs are easy to grow and a treat in August when the rich, sweet red flesh is ripe. Our pot grown Brown Turkey Fig trees/bushes can be planted at any time of the year, whereas bare root figs can only be planted between November and March. Fig trees or bushes can be planted at approx. 3m between plants. It is important to restrict Fig roots for the best quality and quantity of fruits. Prepare your site as normal, removing weeds and grass within a metre of your desired planting hole. Dig a square hole slightly deeper than the root mass and 2x as wide, then place paving slabs around the sides of the hole so they are slightly higher than the soil level (about 2.5cm) and line the bottom with broken bricks or rubble to improve drainage. Alternatively you can plant in a container or next to a wall to restrict roots. To help it establish, sprinkle root grow in the hole. Gently loosen the roots and place into the planting hole. Using 50% of the original soil and 50% compost, fill in the hole and firm around gently. Make sure not to bank the soil up around the collar of the plant. We recommend planting single stem forms of fig trees (not bush forms) with a stake and tie for support. If you’re planting in spring or summer, water the Kiwi plant well and regularly for the first few months and increase watering if there are extended periods of hot or dry weather. If you’re planting in autumn, you may only need to water a little. Once you see your fruits begin to swell, water again. Tip: To check if the soil requires further water, dig a finger down into the soil, a few centimetres and if the soil feels even slightly moist, it does not need further watering. If it feels dry, water and repeat this test again. Keep the area free of competing grass and weeds for several growing seasons. Fig trees should be pruned at three different times of the year. Firstly in spring, removing any branches that are crossing or damaged. In summer, pinch out the new growth, leaving about 5 or 6 leaves. In autumn, remove any of the larger fruits that have failed to ripen but leave the smaller, pea-sized embryo fruits.